437 Ellicott Street - Just around the corner from another classic Buffalo Tavern... Eddy Brady's on Genesee. This classic is a survivor in the center of three historic and entertainment districts: Chippewa, Theater and Ellicott Preservation. Although the Golden Swan is located near the trendy Washington Market and high-end condos and apartments, this gin mill caters to all: from the corporate CEO staying out of public view, to the salary man looking for a stiff drink, to those down on their luck with just enough coin for a draft. The bowery-style bar has been under the control of the current owner since 1997 but its history goes back almost 130 years as the Ellicott Street site is the third location for the business since the late-1800s. 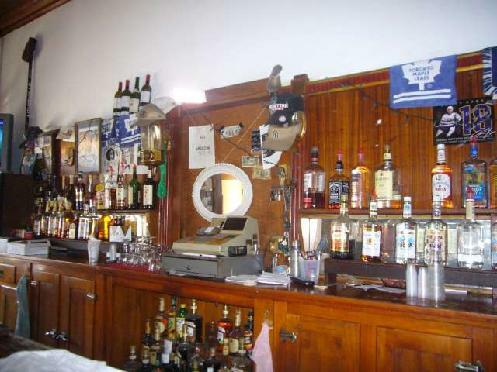 It features a classic, 1940 era Brunswick bar, oversized porcelain coolers, and a turn-of-the-century copper ceiling. Vintage light fixtures are covered in decades worth of dirt, grime and smoke residue. 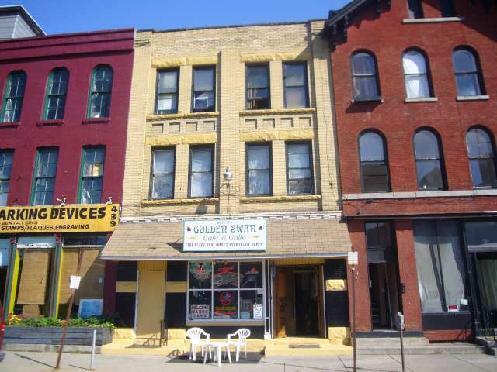 A throwback to taverns of the past, the bars upper floors host a rooming house with 13-rooms. 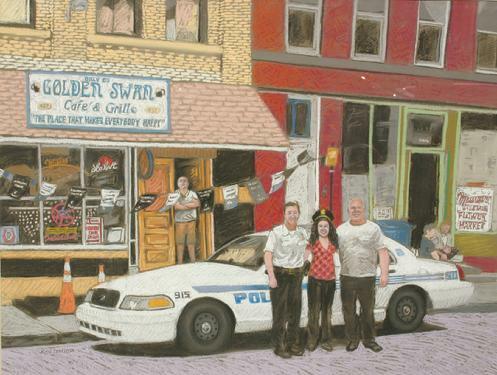 In 2008 the weekly newspaper Artvoice named the Golden Swan as an editors pick for having the best jukebox in Buffalo. 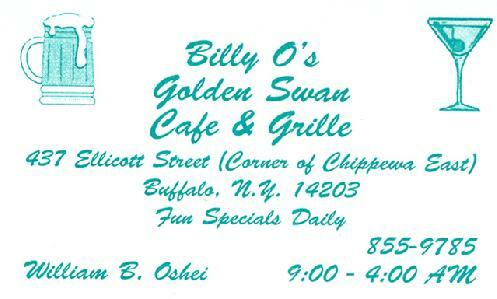 Geoff Kelly wrote: "The Golden Swan on Ellicott Street has several eccentricities to recommend it as a watering hole, not least of which is the owner, a true Buffalo character. The real gem of the place is the jukebox, stocked with a jazz collection the likes of which you won't hear anywhere else. If you show an interest, the owner will play you track after mind-blowing track while you sip the coldest bottle of beer in town." The current structure was built in the 1930s on the foundation of a previous 19th century structure. It is currently up for sale (2008). 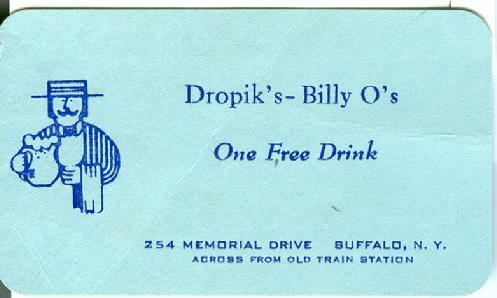 Owner Billy Oshei also at one time owned Dropik's on Memorial Drive in Buffalo's Polonia Historic District. The Swan is part of a row of 19th and 20th century commercial buildings. Just down the Street from the Golden Swan are high-end loft apartments. The Swan's Brunswick bar and bar back are in great condition. A rare sight in Downtown Buffalo... a complete 19th/20th streetscape. 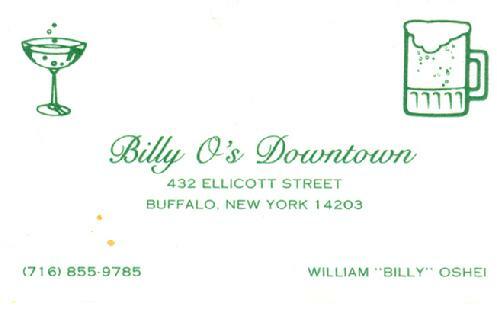 Before the Golden Swan, Billy O owned Dropik's on Memorial Drive. The Golden Swan sits across the street from what was the Washington Public Market. 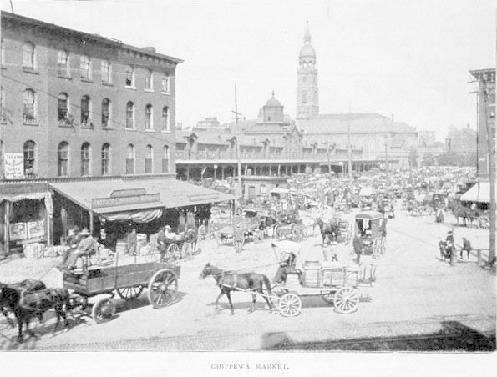 This was one of the largest public market in the City. Today, the site is a parking lot, providing spaces for the Market Arcade, Shea's Theater and the M&T Bank/Goldome Building. 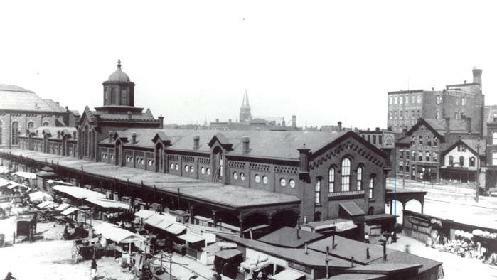 1880's view of the Washington Market. This structure was torn-down in the 1960s to make way for a parking lot. 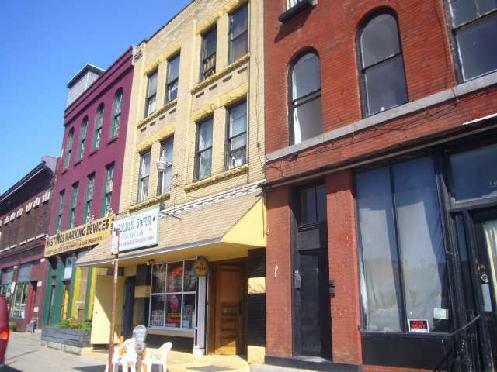 Looking at the Washington Market from the corner of Genesee and Ellicott Streets.